Thursday, April 18 2013 20:00 KASK cirque, Gent. In the context of the Courtisane Festival 2013. Harmut Bitomsky interviewed by Theo Bromin. Originally published in ‘Hartmut Bitomsky: Retrospective’, Goethe Institut München, 1997. As found in the Doc’s Kingdom 2010 catalogue. Hartmut Bitomsky will be our guest for the next DISSENT ! session, on March 28. You have been classified among those referred to as essay film-makers. Perhaps that is a misunderstanding. I make documentary films, and the documentary film is for me still a useful concept, which covers a very large number of possibilities. An essay film creates its own subject; in a way it invents its subject in the process of making the film. It establishes and determines the subject. Whereas the documentary film refers to a subject that exists independent of it and has been established by reality. But can you clearly separate the two? That’s a very good question. They can’t be clearly separated because film is not a science and it’s not literature. I recall something that Pavese wrote in his diary, a demand he made on writing which film is actually much better capable of satisfying. He demands that the analysis should not be openly pronounced, but rather it should be allowed to develop, in a rhythmic way, from an intricate, connected grasp of reality. Intricate and connected! The analysis must be included in life. Sometimes life is also enveloped by the analysis… I’m thinking about Chris Marker. Nothing against Chris Marker, Joli May is a wonderful film. Even if everything in it really refers to Sans Soleil. At first sight Joli May appears to be quite formless. The film is actually a deterioration of form. … And a film d’auteur, mixed with the author’s own private mythology. All of this can be discovered in it. It creaks at the joints and bursts at the seams, like an animal before shedding its skin. And the flow of speech of the commentary, enhanced and inspired by the pictures, is spoken over it, here it is spoken over the pictures, yes, and at the same time it is a bit like reflecting in public. And he has a political passion, an absolute, unbroken vote, and he speaks out. Then there is the unforgettable scene of the man painting the mountain while hanging from a rope, as if the rock were a canvas – the painter is sitting down below in the valley on the veranda with a microphone in his hand and is giving him instructions over the loudspeakers. His orders are heard echoing throughout the valley. There is also something that recalls your films – the compilations, quotations from other films, found footage that was reactivated, Castro in the Sierra Madre. And comics, animated freeze frames, just for fun in between times. But the commentary sometimes comes like a speech balloon, and then it floats like a strange distortion, as imagination above the pictures. 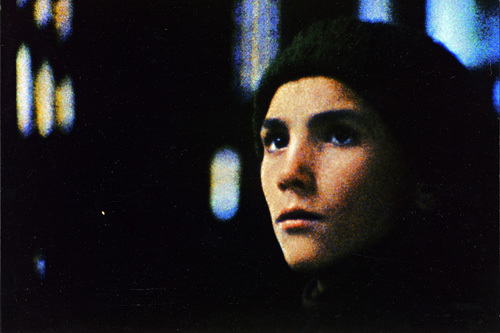 Did Chris Marker influence you? Yes, he did, but only later. Of course the French cinema of the sixties influenced me. Going to the cinema back then meant coming to terms with the Nouvelle Vague. And Le Petit Soldat, Carabineri, Nana S., and Chabrol – Les Bonnes Femmes, and a couple of people in the wrong place like Rouch and Rozier. The Nouvelle Vague turned the whole of the cinema, as it had been viewed up to then, upside down. We had to approve of it and also to deny it. All of a sudden everything appeared to present itself to our view as something new and unscathed. And this view divided the cinema. Depending on your position, you had to say yes to one thing but then also say no to something else. As a general fact you could rediscover that the basis of film is the camera shot. A film is a series of camera shots that sometimes hang together and sometimes move apart from each other. That is a lesson that I’ll never forget. Unfortunately, the camera shot has sort of got lost in the documentary film, under the influence of the Direct Cinema in the United States. The Americans have said that it should be thrown out, that nothing should indicate that a film is being made, and everything should appear as if at the moment of filming no camera had been at hand. First and foremost, I view myself as a film-maker, as someone who takes pictures of things and deals with pictures of things. What other lessons did you learn from the Nouvelle Vague? That you have to keep pace on an intellectual level with what you do as an artist; that you have to know that every story has already been made into a film and that only new variations are being told; that a camera shot in a film not only forms the one situation that has taken place in front of the camera, but it also forms other camera shots that come from other films. Pictures are made from things, but they are also made from other pictures. A film, I once wrote, is the struggle between reality and symbol. I know. They have not considered that there are lost forms, which are destroyed when they are removed from the cast. Is not the scene in Viaggio in Italia overwhelming, where Ingrid Bergmann breaks down crying and runs away when in Pompeii the lovers, in a nocturnal embrace, are removed from the two thousand-year-old ashes covering them? That is one of the greatest moments that there has ever been in film. Because Rossellini doesn’t tell you this, you have to learn to understand yourself what you are seeing on the screen. You have to experience despair yourself. I don’t quite follow you. Do you mean that there is an unconscious film story which is lost in every new film and yet is kept and reproduced? And does that mean that every new film is nothing more than a new form that will become lost? That’s right. Most of the time it is even an undeserved favor when a film is lost and no one can remember anything about it, not even all the reasons why it was once showered with praise. This is the warm current that went through the Nouvelle Vague. Without his films the cinema would have got stuck in the B-pictures in Hollywood or with Hitchcock. Rossellini gave back to the cinema concreteness and realness, the material namely that photography and cinematography need. Now you have to ask me about my documentary method. Your films have always been solidly researched. First of all, you have to press forward and reach the object – it doesn’t just present itself on a silver platter, but rather it needs to be conquered. First you have to develop knowledge, study things from all angles and then accumulate ideas, accumulate them and forget them and then discover them again. There are no rules written down somewhere, and this is how the work on a documentary film begins. From this, some draw the conclusion that it would be best to know nothing at all in advance, so as to approach the subject with a totally unbiased attitude and to put oneself and the film at its mercy. However, I believe that every kind of ignorance is dreadful and leads to nothing but stupidity. With a documentary film there is no script, at least not beforehand. Doesn’t this mean that you are necessarily stupid and ignorant? 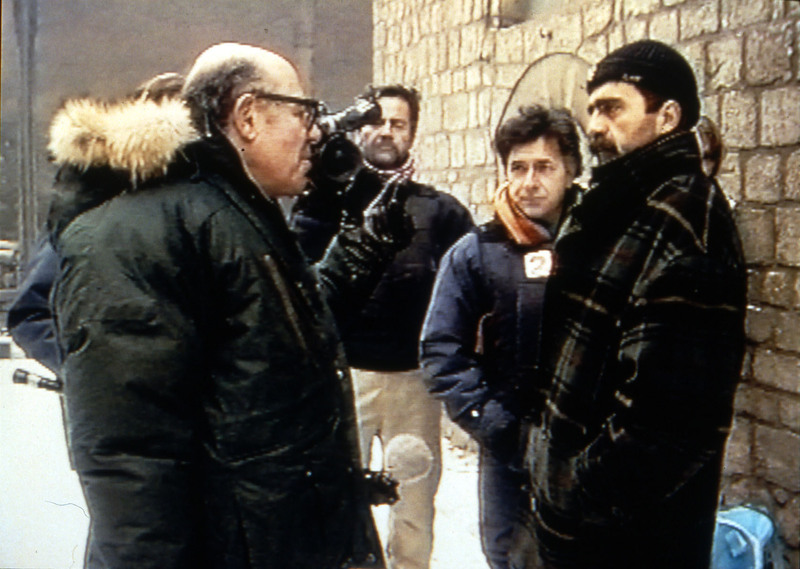 You don’t yet know the script – it has to be developed during the filming. The author of a film writes his script from the future back into the present time of the filming. You shoot the film, but you don’t know what you’re creating. In a certain sense the film is buried in all the material that is acquired when filming, and later during editing it first has to be dug out again from among all the pictures and sounds that are all rolled up in those cans and boxes. This leads then to this other idea, that actually every documentary film is made twice. First if is made during shooting – that which in the moment of filming you have access to, that which offers itself to the camera and which is the situation. And finally when the material is edited, a very specific version is worked out. When editing, all the material is found footage, that is, pictures that were made for a specific purpose, intended for specific contexts and provided with a meaning and an idea – but all this doesn’t necessarily mean that this has been accomplished in the material. Maybe there’s a totally different film buried in the material than was envisaged during the shooting, and this film first needs to be discovered. When editing, I treat everything that I’ve filmed like a quotation, like a film clip that has been passed on to me, and now I first have to look at what it wants to show me. Every documentary film thus becomes a compiled film, one that is made of found material. Exactly. So, when in a documentary film there is the chance to cast an innocent look at the object, a look which approaches it in a completely unbiased manner, then it is when the film is being edited. Unfortunately, most of the time an attempt is made through the editing to make the evidence conclusive that usually the film-maker has already offered before shooting the film, regardless of whether the material can provide this or not. Sometimes a completely different film was made than the film-maker thought and wanted to admit, and then this film is suppressed in the editing room. I have noticed that your films always embark on a path. The subjects suggest a distance, and they have an extended way, a route, which the film then follows. The connecting thread, the narrator that is worked into the story, the guide. Dante needs Vergil in order to show us what hell looks like. I think that every film is a map on which a way has been marked out. In a good film a clever way has been chosen, which leads us past a number of places that invite us to cast a look aside. That is why I look for subjects that mark out this path for us, like the production lines in The VW Complex. When the subject has this sort of extending movement, then the film sets, so to speak, itself in motion. It’s like a river that passes by the camera. Jean-Marie Straub and Danièle Huillet in conversation with Alain Bergala, Alain Philippon and Serge Toubiana on ‘Class relations’. Originally published as ‘Quelque chose qui brûle dans le plan’ in ‘Cahiers du Cinema’ no. 364, October 1984. Translated by Ted Fendt. Jean-Marie Straub: We began by wanting to make a short film that actually turned into the first reel of the film and that corresponds to the short story that Kafka published in 1913 and to the first chapter of the novel. It was only after I looked at what he had added to this short story that I said to myself, “We could try to do the whole thing.” But I wasn’t sure we’d be able to. If it had been The Castle, which I’m just now reading and which I consider to be one of the most important books in contemporary literature, I would have held onto my short film because I find that it’s so literary, The Castle, it exists so much on its own that I would have abandoned it. Cahiers: But where did the desire to make a film of the first chapter of Amerika come from? J.-M. Straub: It came from the desire to make a film in German because it had been clear right away that we didn’t want to shoot it in the United States. And then we always go back and forth a bit between films where there is less fiction and those where there is more fiction. After History Lessons, we made Moses and Aron, after Moses and Aron, we made Fortini/Cani. Then, after Too Early, Too Late, we wanted to do another fictional film and to go back to the tone of Machorka-Muff, with an element of Ubu. The back and forth is also between 16 and 35mm and between large and small budgets. Between Too Early, Too Late, which is by all appearances our least fictional film, and this one, which really is a return to fiction, there was the short, preparatory exercise of En rachâchant, which was like an instigator for Amerika. But the Kafka was the extra push and firm return to the beginning, Machorka-Muff. Cahiers: Amerika is a pre-war novel since for the most part it was written between 1912 and 1914. You’ve called your film Class Relations. For you, what is similar between the period in which the text was written and today? J.-M. Straub: The economic crisis. We wanted to make a film that confronted the period in which Kafka wrote with our own, to see how things are similar and how they are different. Alas, they are too similar! That’s why we immediately threw out the idea of doing a period film. And that’s something that I’m very proud of in this film, this equilibrium between old things, like the police officer costumes, the cars, the sets, and the architecture, and things that are entirely modern like electric trains, telephones, and modern typewriters. Kafka, for us, is the only major poet of industrial civilization, I mean, a civilization where people depend on their work to survive. That’s why there is this permanent fear of losing your job, there are traces left by the fact of having been afraid, and there is constantly misery that appears and is threatening. 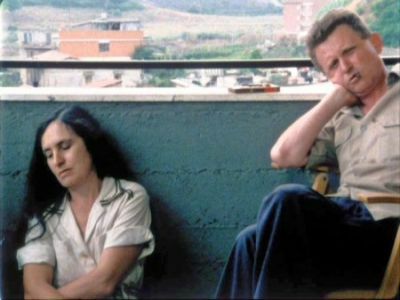 Danièle Huillet: It’s a world where a sense of justice has no place. It isn’t the fact that Kafka didn’t go to America that made us not want to shoot in the US. It’s because in this book the relationships between people are much more German than American. For Germans, Karl is a “Tor,” a fool, not in the clinical sense but like in Parsifal. J.-M. Straub: A fool in Hölderlin’s sense of the word. It’s a voyage across communities of German immigrants in the United States. Even their linguistic community is German. Cahiers: There’s something profoundly democratic about the way that your film poses the question of main character/secondary characters. When a character that Karl meets appears, he exists in a whole and immediate manner, the film takes him completely into consideration until he leaves the screen and we meet another one. In your film you also chose to get rid of groups and masses of people. In Orson Welles’ The Trial, on the contrary, we often see Anthony Perkins in the foreground and masses of people behind him. J.-M Straub: When Kafka talks about 40 girls typing, he puts his camera on the ceiling and he films 40 of them. D. Huillet: It’s true that there’s a choice there: we show one elevator and not 40. In fact, there is one filmmaker who could have shown 40 elevators, he’s dead, and the machine that would have helped him to do it is dead as well. It’s not Welles, it’s Stroheim. J.-M. Straub: That’s how Amerika had to be done; the way Stroheim reconstructed Monte Carlo. But since we weren’t able to do that, it was more worthwhile to go entirely in the opposite direction. Cahiers: Apart from that choice, you also took out the scenes with groups, like the ones in the bellhop’s quarters. D. Huillet: We tightened certain scenes, like the first conversation with the head cook. At that moment, in the book, he was turned towards a very dirty, smoky bar where people were on top of each other. There were spectators, extras, and we didn’t want to show any extras. J.-M. Straub: We also got rid of what happens after the audition for the Oklahoma Theater where there was a banquet before they get on the train. And in the train there’s a compartment where the people he’s with are smoking, playing cards, making noise, and where they are so close together that Karl has trouble getting to a window to see the landscape. None of that is in the film. J.-M. Straub: The other day, at the Cinematheque in Beaubourg, we saw a film by Stroheim that we didn’t know, Hello Sister. It’s great to see all that we’ve lost, in cinema, along the way. Because democracy shouldn’t only play a part among the characters but also at the equilibrium between the characters and the space in which they are shown. When Stroheim shows a street, the street exists. When a character crosses a street, it’s terrifying; you feel the danger of a street, the traffic, and a human being in a street. And the human being isn’t more important than the traffic, the traffic isn’t less important than the human being. And when you see a dog who throws himself against the curb – it’s a shot that lasts only a moment – it’s really terrifying. There are very few people who are still able to do that. I think that Kafka has that sense and it’s what interested us and what we modestly tried to do, not as well as Stroheim, with other means, but in that way. J.-M. Straub: Even space has disappeared. Today spectators are shown a space that doesn’t exist. It’s what bored me so much in Fassbinder’s last films, except maybe Querelle: we no longer know that we have two feet on something or on what planet we were on. Today, in films, you know longer know that it’s a wall or a door that opens. To film doors that open, to put people in a car, to film them in the street is very difficult. You have to pose the question of what three dimensional space is. In films made for TV, it’s cleared away, it isn’t necessary for it to be there, if so it’s a bad TV movie. Cahiers: Concretely, what does it mean for you to pose that problem? J.-M. Straub: Well, at the editing phase we find ourselves with 25 hours of synched film. We’ve burned 245,400 ft. of negative. D. Huillet: Which makes the shooting ratio 1:20. 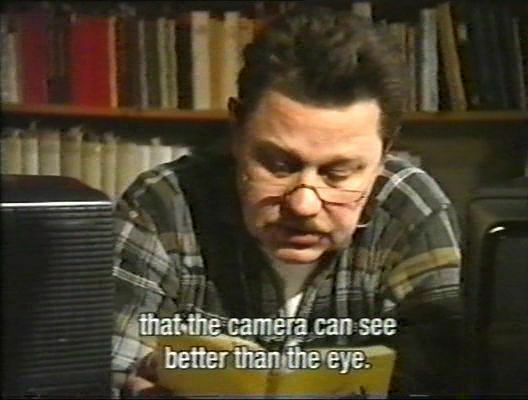 D. Huillet: Because it’s short shots. That’s when you realize that Bresson isn’t crazy. J.-M. Straub: Neither was Chaplin, who shot even more still. Because he filmed action. If you film action, either the first take is good or you have to shoot 30 more, and it’s only the 27th that’s good. Sometimes with a guy who opens a door, sits down and moves a pinky, it’s only on the 27th take that he manages to do it freely in a frame, that’s the rhythm (partition) that imposed itself and that we discovered with him. And that, that is never produced before the 13th take. We noticed during the editing – it’s a bit pretentious to say it like this but it also brings us back to the question of democracy – that that’s how Sade should be filmed if you were filming Sade. We thought about that while looking at Klara and Karl’s relationships in particular. This film could have been called Karl Rossmann or the Misfortunes of Virtue. D. Huillet: I believe that the fact that he wasn’t characterized is what seduced us, at the beginning, in the choice of this actor and it’s what then scared us a bit. But at the same time – and I hope that this is felt in the film – he always judges what happens to him. J.-M. Straub: It’s true that you could talk about a blank slate there…What happens, I believe, is that he has no specific social existence. D. Huillet: Except for when he is with people who are below him on the social ladder. J.-M. Straub: In his relations with the stoker, for example, it’s a sentimental petit-bourgeois side that comes out. Cahiers: At the end of the film, there is this amazing shot on the train where, for once, Karl is entirely equal, in the image, with the boy who is seated next to him. J.-M. Straub: If that shot is impressive, it’s because for once there is no longer the third dimension. And moreover, it’s the only handheld shot. Cahiers: Do you consider this ending to be the end of the novel or not? J.-M. Straub: Max Brod says that Karl had to find his parents, that he would find them in heaven, so to speak. Others claim that that’s not true. I don’t know, but for me it stops there. I was totally incapable of inventing a utopia. The ending is the moment that he gets out of this mess and goes to a place where he will finally no longer be threatened, where the machine of lies will cease to function (we’ve never invented a character where the steam roller, the spiral of lies goes as far as in the extremely strong arguments of the hotel manager: it’s horrifying). At the end, he’s sitting with someone who will no longer threaten him and he is going towards a place where one hopes everything will be different. Cahiers: If you consider that the whole film is a descent, then at the end we rediscover a kind of innocence. J.-M. Straub: Yes, the whole film could be a vertical line and there, on the contrary, is the first time that you are on the planet. Everything becomes horizontal. Or should become so. Cahiers: At that moment there is also the rediscovered innocence of the countryside. J.-M. Straub: Let’s say that I didn’t want to do a “Straubian” shot. We had filmed entire reels of the landscape but I thought I was going to only use a few seconds. Danièle said to me, “There’s nothing you can do, this landscape supports itself.” Finally I let myself be convinced by Danièle and by the material. Cahiers: This moment where Karl Rossmann begins to escape the steamroller of lies is the moment that you chose to inscribe the truth of the landscape, since you actually shot those shots in America. J.-M. Straub: Yes, it’s no longer a set at all there, the United States of 1920 in Germany today. They take off for a new world, towards possible utopia. Cahiers: Why did you shoot in Hamburg? J.-M. Straub: When I left France in 1958 and I had been sentenced to a year in prison, I wanted to live in Hamburg. And that’s where I had been, after Amsterdam (where Gustav Leonhardt, who we wanted to act in our first project, Chronicle of Anna Magdalena Bach, practically ready in 1959, lives) and after East Germany (where most of Bach’s manuscripts and partitions were located). But we said to ourselves that it would possibly be easier to find money in Munich. So we had lived in Munich and we shot Chronicle in 1967! I really loved Hamburg. When we thought of the Kafka film, I immediately thought of the house where Karl makes himself put back the letter from his uncle. That’s a house where we already shot some shots from Chronicle. Once the permission to shoot for 10 nights in this house was obtained – which was not certain – we abandoned the idea of Berlin as a possible location and we began scouting locations in Hamburg. Why Hamburg? Because it’s a port, and it’s from there that he leaves. What you see at the beginning and what should help the projectionists to find the frame before the opening credits is a monument in the port of Hamburg, a pirate who had his head cut off with several others in 1411 by the patricians in Hamburg, because he threatened the nascent business of the Hanse. Let’s say that it’s the last image that Karl Rossmann has of the old continent. Cahiers: What determined the choice of the black and white? D. Huillet: It was important in facilitating the back and forth between the present and the past. J.-M. Straub: Especially in Germany, where everything is so American, colors aren’t American. Cahiers: How did you do the subtitles? D. Huillet: I must say that in French, Kafka doesn’t exist. It’s extremely difficult to translate into French: it becomes too weighty or unfaithful. When you do the subtitles, you’re lucky because the text is there. The subtitles are only an aid to hear the text. I don’t translate everything but what I translate I translate as literally as possible. J.-M. Straub: The untranslated things never interrupt the continuity of the discourse. What is missing is often purely descriptive. But what is translated respects the spoken rhythm as much as possible. People have to be able to see the image without spending their time reading subtitles and those who don’t know German have to hear a bit of German for once, without being there to catch any concepts from the reading. Cahiers: What does this film represent, for you, in your cinematic progression? I believe that what we’ve looked for, consciously since Moses and Aron, is monumentality (that’s Seguin’s word). The monumentality of the character in relation to the set, the monumentality of the set in relation to the character. Something that in the spirit of two painters who I never think about while shooting but who I think about while imagining. The first is Giotto, not Giotto in general, but the one who I discovered in 1951 by riding my bike to Scrovegni Chapel in Padua. Films don’t have anything worthwhile if you don’t manage to find something that burns somewhere in the shot. And most filmmakers no longer have any relationship to the language they were born into, in which they work. There are films where the manner that people talk has nothing to do with the house in which they were born which is the same as their mother tongue. A specific language, not a universal language, because cinema is not a universal language the way the Italians, Lizzani and others pretend. 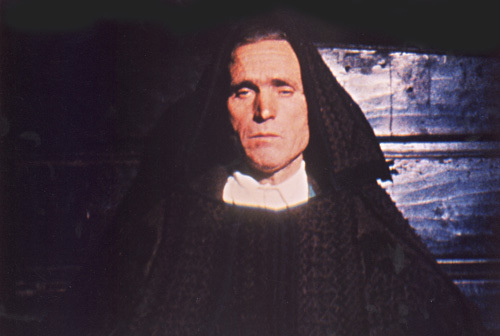 Speech is a touchstone for judging films: there are films where the German or Italian language becomes sick (those by the Taviani brothers or Francesco Rosi, for example). The other aspect is that at each second of each shot, what Renoir called the magical, the magic of reality, must be felt. And that’s why Stroheim is the most important, more important than Griffith and John Ford, even though for me the most important thing that I know is Civil War in How the West Was Won. That everything you show is both magnificent and the opposite must be felt. Bunuel’s idea that we don’t really live in the best of all possible worlds, but that in spite of everything it’s the best of all possible worlds because we haven’t yet found a better one… The other painter is the one who painted Montagne Sainte-Victoire so often and who said “Look at this mountain.” He was trying to capture it as a mountain and not something else. It wasn’t abstract painting although it already went beyond that, it was already cubism and something that was richer than cubism. He said, “Look at this mountain, it was once fire.” And that, that goes for everything that we show: it’s like this but it could be different, it’s magnificent and horrible, man is not the center of the universe. Or again Rosa Luxemburg’s idea: the death of an insect is no less important than the death of the revolution. Originally published in ‘Cahiers du Cinéma’, no. 276, May 1977. Translated by Kelsey Brain, Ted Fendt, Bill Krohn. 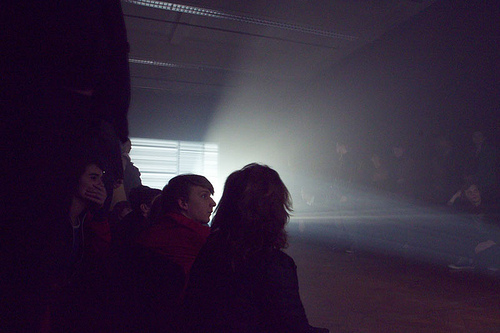 ‘Trás-os-Montes’ will be shown during the Courtisane Festival (17-21 April 2013), as part of the programme “Once Was Fire”. Cahiers: What can you tell us about the shooting, about the conditions in which you worked with the peasants of Trás-os-Montes? A. Reis: I can tell you that we never shot with a peasant, a child or an old person, without having first become his pal or his friend. This seemed to us an essential point, in order to be able to work and so that there weren’t problems with the machines. When we began shooting with them, the camera was already a kind of little pet, like a toy or a cooking utensil, that didn’t scare them. So using their lights in their homes or setting up reflectors in the fields to have indirect light wasn’t a problem. It was a sort of game at the same time. So it was possible to insist on certain things, most often with tenderness. And if we were having a problem, they understood very well. A very important thing: they were able to confirm from our work that we were also “peasants of the cinema,” because it sometimes happened that we were working sixteen, eighteen hours a day, and I think that they liked seeing us working. And when we needed them to continue working with us, even while leaving the animals without food or the children without care, they didn’t feel, I think, it was a constraint. It was admirable to see this. You know, I don’t have a tautological conception of people, but I believe that in the Northeast, they have a very special way of treating people. If you arrive – suddenly – they greet you, they open their door to you, they give you bread, wine, whatever they have. At the same time, they are not “kindness personified” because they are also very hard. Only they go abruptly from gentleness to violence. Cahiers: What relationship did they have with cinema, or television? A. Reis: In the village where we shot, I can tell you that there was neither cinema nor television. (He makes a drawing on the paper tablecloth.) Portugal is like this, Spain is like this, the Northeast is here. Here, there is a town named Bragança and, there, another named Miranda do Douro. All the villages we shot in are situated near the border and in the vicinity of these two towns. So the peasants know that there’s cinema and television in Brangança, but that’s all. In many of the villages, there is still no electricity. The connection to cinema is still a connection to photographs, quite simply. Cahiers: How, as soon as you had had the idea and the project of the film, had you thought to avoid looking at these peasants through an ethnographic lens? anthropological problems posed by the region, in Celtic literature, etc. We read all of your Markale (the French writer -Ed. ), because the Celts are still there. We studied Iberian architecture because the architecture of the homes there was not born by spontaneous generation. But it was always with the aim of choosing, of intensifying. Because if we read a landscape solely from the point of view of “beauty,” that’s not very much. But if you can read at once the beauty of the landscape, the economic aspect of the landscape, the geographical-political aspect of the landscape, all that is the reality of the landscape. The integrated land, without any transformation, the cultivated land, etc. So, on the subject of the Northeast, we treated dialectically everything we knew, everything we learned from the people, everything we discovered ourselves. Because it was also possible to discover things. Margarida was born in the most violent part of the Northeast. Even today, she remembers the taste of the wine, the childhood legends and the nightmares. All this became material, with a certain depth. Cahiers: But for someone who lives in Lisbon, what is the Northeast? A. Reis: It’s very far. It’s from there that electricity, almonds, good sausages, hams, iron, etc, comes. What the peasants of the Northeast say about the capital is what is said about the Northeast in Lisbon , except for emigrants from the Northeast in Lisbon. To them, even if they’ve lived for twenty or thirty years in Lisbon, if you say the name of a tree in their subdialect, they still tremble. A. Reis: I can tell you that on this subject, we adopted, Margarida and I, a principle of tabula rasa. In the film, we never deal with institutions. Because Catholicism is a very recent religion there. You sense in the film that there are much older religions and among the people themselves, Christianity is a very superficial thing. It’s not an exaggeration or a poetic liberty to say that they are druids. If you hear them talk about trees, about how they love them…there is there something very old that has nothing to do with Christianity, which had to be made present through its absence. The film is a fresco, an epic of the Northeast, it’s vaster than a small chapel in an artificial world, with the village priest, etc. I think that a film with all that as a subject should to be made differently than the one we made, with other implications. Cahiers: But you can’t deny the Church’s influence recently in the North of Portugal. What did it use among the peasants in order to make them move politically? Cahiers: That would be in keeping with the feeling at very the beginning of the film where we see a child, a shepherd, who sees an inscription on a rock, an inscription that refers to a very distant past. A. Reis: You know, there are three shepherds in the film. All three are different. The first, the one you’re talking about, is a force of nature. He is like a Fulani in Africa or a shepherd in the Middle East, a shepherd who has a profession, a code with his sheep, who walks in the night, who still belongs a bit to the Neolithic age. What he says to his sheep is a code where it is difficult to separate the music, the phonetic and lexical aspects: you feel a shock between these elements. And he speaks a subdialect older than Portuguese. He is very different from the last shepherd. He’s a primitive in the good sense of the term. Cahiers: How did the idea of the film come to you? A. Reis: I’ve already said that Margarida was born there. As for me, I was born in an already eroded province lacking force, lacking beauty, lacking expression, 6 km from Porto. So inside me I had the desire to be reborn somewhere else. And the first time that I went to Tràs-os- Montes with an architect friend, I felt that I was born there. So, I’d known the province for several years and, in working with Margarida, in going there often, I said to myself that it would be nice to make a film there because everything came together in a cinematographic sense. To the point that when we began shooting, a lot of location scouting had been done long before. That doesn’t mean that we didn’t plan things, but it was a flexible plan. In many scenes, for example, it is very difficult to distinguish what was filmed en direct from what was not. The dialectic of these two aesthetic positions was hellish for us. But we believe we’ve succeeded in making, not a synthesis, but a confrontation of contraries. Even en direct, on the one hand, we needed all the speed and all the surprise but, at the same time, we cleaned up some parasitic things that didn’t make sense or that were gratuitously populist. And for that, we needed an insect’s eye. Cahiers: I had the feeling that, during the whole first part (the one with the children), you were using the fiction to progressively bring out more naked information, more closely related to what one expects from a documentary. A. Reis: But when the mother is telling the story of Blanchefleur, is it fiction or documentary? It’s both. In a village it can happen that an event is fiction. So what is surprising about a village is that if you are there, you see only the golden dust, animals at the spring, etc. But if we can go from one house to another, then to a river, then through a door, things become so complex that you can no longer talk simply about fiction and documentary. civilizations that came after, and everyday life today. It is there precisely, in this refusal to separate, that I find a progressive and revolutionary element. Because I think that the masses there know how to assimilate from a critical point of view of the forms of life that owe nothing to the city. Because these people aren’t inclined to always lose. They begin to realize, seeing their sons returning from Europe, that that doesn’t make up for anything. The sons who return from Europe build a house “next to” the others, fence it in, and the parents think, “My son has gone mad!” And so it arises that the old disagree with their own children. They know very well that they have a richness and that there is a genocide against them. This is why, at those times, they can say, “We’re going to cut off all the supplies, the food for Lisbon.” It’s not only to be reactionary; it’s that they want their hands and their heads to still have value. Going back to what you said: in fact, there is a turning point in the film. This turning point is the lyrical quality that is always threatened. Even when the children amuse themselves at the river, they discover death with the frozen trout. The big dusty house or the deaths or the child who plays with the top (who is the one who goes to the mine), it is always a threatened world. I believe that the film is always transforming. The so-called “finale” has to act like a boomerang: viewers need to be compensated by the lyrical space and time of the first part in order to support what follows. When the blacksmith regrets that people are leaving the village, this refers precisely to the mutilated children and the deaths from the colonial wars, these are them. Those who are going to come to Lisbon, to Europe, in the slums, in the factories, etc. That’s why we treated these young children with so much intensity. If you go there, you’ll see, they’re like that, there’s no naturalism, they’re still sort of angels. Cahiers: There’s also the feeling that it’s them who are the link with the past. The adults are kind of in the background. They appear through the voice over, not onscreen. A. Reis: Because there are no adults there. The voice over you hear, a little violent, a little oppressed, is the voice of a character who we see for a brief moment in the film. It’s a miner’s son, an executive. His father spent fifty years at the mine. The voice of this man is traumatized. He speaks of the old community of miners who were former peasants. Never in our film do we talk about the communities of villages, but you have to feel that they exist. We do the dance, we walk in the dark communally. The voice over counterpoints the life of the miners like the train whistle counterpoints Pergolesi’s music that we hear for a moment. There is always a crossing, a dialectic of the sound with the image that interests me a lot more than all these stories of connections, of ellipses and other rules from film manuals. Cahiers: At one point in the film you quote a text by Kafka which says that people are far from the Capital, therefore from the Law, which they try to guess but which they never manage to do because the Law is possessed by a small number of people, etc. Can we consider that this is shorthand for the historical situation of Tràs-os-Montes in relation to Lisbon? A. Reis: Yes. We translated the text by Kafka into the subdialect and, as a result, this text became very guttural, very expressive, endowed with an extraordinary force. They have a marvelous word designating the manner in which the nobles use the Law to their benefit: “baratím.” Because the laws of the community are flexible, they are transformed by historical change. These are of course oral laws, they aren’t made once and for all, they are flexible. And it is precisely because of this flexibility that they were liquidated by the written Laws. One day, it is such and such a shepherd who leads all the sheep to graze, another day it’s another shepherd. There’s a sort of primitive communism in this region. And we feel that at times they are closer to the future than people in the city. For example. if Lisbon lacks water for twenty-four hours, there is a collective neurosis! How, given the toughness of his life, does a peasant face snow, fire, heat, etc. With what endurance. Even when certain peasants were imprisoned by the PIDE , they succeeded at resisting. Why? And how many friends have I known in Porto who spoke a lot and very loftily and who, when they were imprisoned… I don’t want to say that the peasants are more courageous and the other more cowardly. But why, for example, when the peasants of Baixo Alentejo were arrested, did they have an endurance that people from the cities did not have? A. Reis: We have made the sound synchronous, obviously. We have, like you say, organized the units, as if it were possible to have a symphonic sound. These are units which will sometimes echo further on. I’ll give you an example: when the old woman in black has just told the child who has fallen, “Do not cry I’m going to sing ‘Galandun’ (a song from the Medieval Ages) to you,” there is a voice that says, “the dancers who rise up, who rise up…” And she is already working to memorize what she has lost and we see then the men who dance close up, blurred, and then from far away, like on a postcard. We allow the spectator the attention to think: “Look, a postcard!” Because the peasants never actually danced at that place. It’s what we ourselves imagine today. But pay attention: you have to to wait until the end of the film to really give that shot meaning. Because later, we see the old woman who watches and you might believe that she watches the dancers, but that’s not true. These are successive disillusions, but not traps. Often people say of the film: the rhythm is too slow. This is because you have to wait until the end of the film to say certain things. And how the different units proceed dialectically, for us, is very important. What’s bothered us a lot is that we edited in black and white and we haven’t had enough time afterwards to work on the color. Working twelve months at an editing bench assembling in black and white a film that we should have seen in color! Cahiers: Who has the film been shown to? What reactions has it provoked? Cahiers: But exactly how can a film contribute to helping these peasants who are otherwise so cut off from film? A. Reis: Of course, there are cinematic language problems. They don’t possess this language there. But there are elements which are very important in their everyday lives, things which relate to the theater of the middle ages. They live in a space, at home or in nature, that is already cinematic. I’m certain that if they study film, they will become filmmakers. A peasant said to me one day, “What? You’re leaving for Lisbon without ever having seen the light which goes from such-and-such kilometer to such-and-such kilometer? How can you?” With difficulty I find people in Lisbon who talk to me about the light on the bricks or on the streets. So when the peasants saw the film, they recognized these things they liked and that belonged to them, even if sometimes our imagination or our freedom of expression bewildered them. For example, the snow scene. They’ve never eaten snow like you see in the film but they’re affected by snow, by the beauty of snow, by the glare of snow. So, as there are people who eat dirt or straw, I made them eat snow. Cahiers: I would like to ask you a more general question about the cinema of Portugal. First, does a “Portuguese cinema” exist? Then, what has changed since April 25th? And you, what do you think is working and not working? Cahiers: What kind of reactions did your film provoke amongst filmmakers? A. Reis: On this subject we rather like enfants terribles. Margarida and myself. We don’t recognize any influences. Even when people want to compare us to Manuel de Oliveira, we refuse it, even if we have great respect for him. Even if it’s only for the way he works, for his standards. 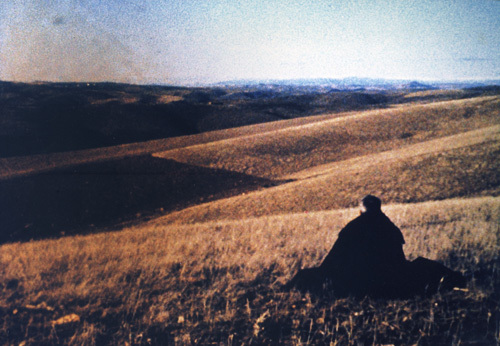 Otherwise, the films that we want to make are perpendicular to those of Manuel de Oliveira. Because there is a tendency leaning towards the metaphysical in his films, remnants of Jesuitism, which don’t interest us. A. Reis: I believe so. I think that the life in Lisbon doesn’t leave filmmakers a lot of time to go deeper into what they say. I don’t want to be hard on them because they’re my friends, but I believe that sometimes their way of life blocks them. I think they’re adult enough to know the fundamental reasons for why we are engaged in cinema. I believe that cinema is a matter of life and death. For us, we can’t cheat. Twelve years, give or take. There comes a time when one has to ask what makes it worthwhile. Seeing, discussing, showing pieces of cinema, and all the while trying to make sense of them, and of ourselves in the process. We’re not in this to make a living, surely. But it has to do with living nevertheless. Perhaps the time has come to try to put into words where we stand, or rather in which direction we are heading. We, that is: courtisane. We, that is: in all good faith siding with cinema. More of an open-ended itinerary than a well-devised directory really. To begin with, let us once again bring up the exhausted elegy bemoaning the terrible “end” of cinema we have been hearing as long as we remember: cast out by television, hollowed out by publicity, bought out by the dream machine, walked out on by its public. No doubt, cinema is not the dominant medium it once was. For sure, It is no longer the medium that captures the imagination of the masses (nor is television, for that matter); we know it is rather being captured by the logic of the market. In return this also means that the “audience” (a word that has more and more come to remind us of statistics) expects cinema to hold up a mirror, to function as an ideological resonance chamber. It’s for this sociologically defined “audience” that most films are scripted, fabricated, distributed, more as raids on the cultural market, than as forms of artistic production (all of the sudden the word “production” makes sense again). Should we come to the rescue, knights in shining armor and all that? Certainly not: there are still plenty of more or less knowledgeable professionals out there supporting and cultivating cinema in its many forms, under its many umbrella terms. The only thing we can do, us amateurs, is to try to configure the cinematic landscape in a different way, to propose a counter-geography. For example: to get out of these all too easy and sterile sets of oppositions between “mainstream” and “experimental”, “system” and “margin”, “fiction and “documentary”. Why? Well, first of all because these opposites have more in common than it would appear; and then, because we think that the most interesting things are happening in their “inbetween”, there where the rug is pulled from under our feet, forcing us to look for other footing. Of course, there are oppositions that are even more sterile: the ones defining cinema by its negative, by what it is not, in order to point out its “specificity”. This game has been around for quite a while now, especially in the hallways and corridors of the academic world, studying cinema out of sight from everything that could possibly pollute it. An ancient debate all over again: the ”pure” against the “impure”. Words that frighten. Naturally, we take sides with the latter (Bazin’s ghost continues to haunt us after all). But this doesn’t amount to embracing everything – an impulse gaining popularity these days, in service of the cultural “omnivore” – on the contrary, it’s about making concrete choices, exclaiming and defending them. It’s about mapping out different pathways through cinema’s heterogeneity, slicing it up, exploring its many contours from specific angles. This also implies probing the affiliations with other media and forms of expression. Nothing new here: cinema, as a “medium”, an experience of image and sound, has escaped its primary parameters a long time ago. We all know this. In fact, we have been battered with this idea so often in recent times that, paradoxically, we are more and more inclined to renegotiate some basic assumptions, or rather: some basic questions. It’s a trust issue really, boiling down to the question “what can cinema do for us?” What can it teach us, about ourselves and the world we’re living in? And this might seem overreaching, but it is really not. We just forgot about some things. Most of all, we forgot about the promise cinema once stood for: the promise to give us a place in the world. Not by holding up a mirror to ourselves, but by mapping out a space and time where we could meet the other. You win some, you lose some. Gone is a certain naivety, a certain innocence in the light of the gravity of the spectacle cinema has to offer. But perhaps this innocence is something we all lost along the way. Abundance? Overexposure? Cynicism? These are some of the easy responses, characteristic of our times, but the truth is that we, as spectators, hardly ever feel addressed any more, at least not as human beings (all the more as cultural consumers). The truth is that it has become rather difficult to attribute a cinematic work to a desire (all the more to a whim or a strategy). So where does that leave us? How does one get out of this sphere of conformism, gloom and boredom all around? For us, taking on this challenge involves an attempt to regain this unattainable innocence, to reconsider cinema’s capacity to bewilder, make us experience the world anew, in the here and now. It involves searching out bodies of work that radically or gently question the consensus, either by redrawing the landscape, rearranging the places and paths we tend to call “reality”, or by displacing the angle of vision, revising what is seen and what can be thought about it. But we should never forget that “us” would be nothing without “you”. That is what this festival is all about: this fabric of sensations and impressions is here to be shared. In the end, there’s only one thing a festival should strive for: to become a community of sense. Alone together, at least for a while.